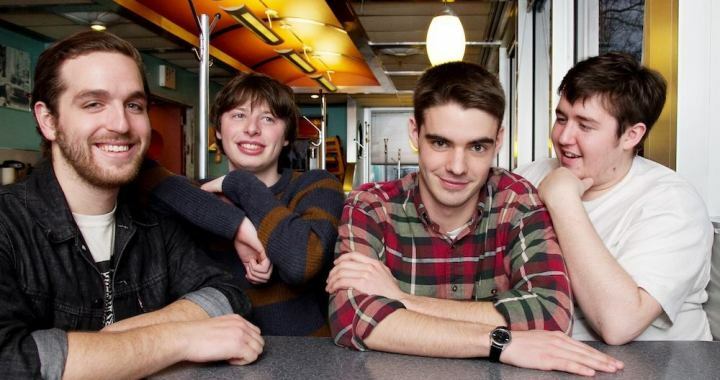 Modern Baseball are in the UK for their first headline tour supported by Spraynard and Losing Sleep. We had a chat with bassist Ian about the band’s success, Riot Fest and their local scene in Philadelphia. This tour’s been awesome. We’re only on like our third day but we’ve got the opportunity to tour with Spraynard who are one of our favourite bands, and Losing Sleep are awesome, awesome guys. It’s just been a lot of fun, a lot of hanging out and a lot of playing music [laughter]. [Laughter] yeah I’m kinda tired. We slept in this room last night which they said would have three beds and four couches which would be amazing. But we got here and it was this tiny room and we didn’t all fit in this room [laughter]. Pat from Spraynard slept in this corner between two couches in a tiny corner. I slept kinda diagonally. Sean [drums] slept under a table [laughter], so we didn’t really sleep too well. Riot Fest was amazing. It’s my favourite festival. I’ve driven there the last couple of years from my home in Philly, about 14 hours away from my home because all the bands are incredible. The lineup is always amazing. I think the lineup this year is the best lineup I’ve ever seen. Yeah, it’s incredible. This year when we got asked to play, it was like… “yeah, let’s do that!” It was cool because the first thing we did was play a Riot Fest aftershow with The Get Up Kids which was huge for us. They killed it. They are such a good live band, and I don’t even remember the last time they played together. Then day two we got to see a bunch of friends who were also playing, then I got to see Descendents play Milo Goes to College and that was really something else. Never thought I would see that. And then the next day, we played to a million people. Not like a million people, but there were a lot of people and that was a lot of fun. Then I watched Weezer play The Blue Album. Just a great time. Mark from Spraynard: How’s it been touring with Spraynard? Well here’s Mark from Spraynard [laughter]. Mark from Spraynard: Have fun. I’ll expect the real answer on the recording. I know you won’t say it in front of me. They all smell really bad, especially Mr D., the bassist [laughter]. Well… How’s your scene back home? When we started we played a lot of basement shows, Philly is known for having a lot going on. We don’t really play that many basement shows anymore. We do as much as possible because they’re so fun. But yeah, it’s a great scene. We’re all going to shows when we’re back home. There’s literally one show happening every day. It’s insane. A few years ago there was a poll taken by this one group called DIY PHL which logs all the shows happening and they found there were 73 different houses and DIY venues putting on shows, not even including the real venues because there are a bunch of those, too. Yeah, Corporate Hearts wrote a big thing about the Philadelphia scene for us which is really cool. Oh Corporate Hearts? Yeah, that’s sick. I saw them play once at a house when Tom from The Menzingers was playing a solo set and they opened and it was awesome. Awesome guys. Do you think there’s much difference in audiences between the US and the UK? Yeah, it’s not a huge difference but one thing I’ve noticed is that in the UK it’s way more respectful. I mean, people still go crazy, but in America there’s always this one person who comes up on stage and will just like shove me out the way so they can stage dive [laughter]. Just knuckleheads. But yeah, over here it seems like most people are super respectful but still go crazy. So you guys sort’ve have exploded in the last year or so, does it feel like it just kind’ve happened or do you think you snowballed? Yeah, I still don’t get it. It’s been since Sports, when we put out a pressing of 300 and it sold out within five weeks. We didn’t even think we would sell them or break even on them ever. So since then, Run For Cover signed us and like even just yesterday a show was announced where we’re playing one of Taking Back Sunday’s holiday shows and the lineup is literally just them and us [laughter]. It’s crazy. I’m so thankful, I don’t know how it happened but I’m thankful [laughter]. What do you think the reception to You’re Gonna Miss it All has been like compared to Sports? There’s a lot more people now listening to it just because we’ve grown as a band. People seem to like both of them, but our approach was different with it. These songs were specifically written for the new one whereas for Sports, they were the best songs picked out of a group of fifty-something songs. But yeah, for You’re Gonna Miss it All, everything was written for that record and we recorded it all at once. We used to go from like 11PM to 8AM because it’s all we could book in the studio, then we’d have class at like 10AM, and that was just miserable [laughter]. So for us I think we were able to produce a better product. Are you all still in school? Yeah we are all still in school. We just finished up our summer term before coming over here. We have about a years’ worth of school left. But yeah, I’m 21, Jake’s 21, Sean’s 22 and Brendan’s 23. Is it hard juggling it? Have you got any tips for other small bands starting up? Just be friendly and respectful to other bands, and other people, and then they’ll want to work with you and help you out. Don’t try to do anything, just kinda let it happen, otherwise you’ll try to hard. My favourite song is Re-Done, but we don’t play it all the time, purely because it is so long and we don’t always have the longest sets. So it’s a real treat for us. I think it’s all of our favourites. I also really enjoy playing Rock Bottom, and we just started playing The Old Gospel Choir which is a blast. When we get back we leave pretty soon for the tour with The Wonder Years, The Story So Far and Gnarwolves which is gonna be a blast. And then, we got a little more coming up in December which I can’t go into detail about, but that’s gonna be fun. Posted in Bands, Interviews and tagged emo revival, fe/wr, indie, modern baseball.